Nepal is a multi-cultural, multi-racial, multi-linguistic and multi-ethnic country. Nepal has been a feudalistic society and distinctively stratified across class lines so codes of manners, dress, language, rituals, norms of behavior and faiths in various fields of life are the ways to live life. Nepal is as diverse in her inhabitants as her geography and climate. Although the climate from Mechi to Mahakali or mountains to Terai differs, one region is depending on another for various reasons. If water does not flow from mountains and hills to Terai, then there is a drought in Terai. If the food products from Terai are not supplied in mountains and hills, then there is a scarcity of food. The electricity produced in hilly area is utilized in Terai. In this way, we can say that there is feeling of social harmony in our country. Nepal is a cultural mosaic depicting unity in diversity; while issues of ethnic and regional equity tend to dominate the agenda of the government, the Nepalese are people of tolerance and harmony. Although Nepali people practice different religions, there have never been any conflicts regarding religion. Religious respect and tolerance are very important values to Nepalese. There are more than 50 major festivals celebrated in Nepal throughout the year. Most festivals have the religious hue and are related to different Hindu and Buddhist gods and goddesses. Festivals like Vijaya Dashami, Deepawali, Buddha Purnima, Lhosar have national significance. However, there are some festivals which have historical significance and others are seasonal celebrations. For the Nepalese, festivals are not merely the annual spectacles, but also are a living part of their rich cultural heritage. 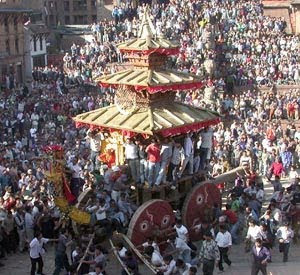 Festivals have brought unity in the evident diversity that exists in Nepal. Efforts are to be equally undertaken to preserve and promote all languages and cultures so that Nepal could be developed as a genuine mosaic of all cultures and languages. These are positive efforts that would certainly have a far-reaching impact for the equal development of all ethnic, lingual and cultural communities that exist in the country. Although the government is effortful, its efforts alone may not be sufficient. There should be equal efforts and contribution from all sectors for the preservation and promotion of this ethnic and cultural diversity. Nepal is a cultural mosaic depicting unity in diversity. There should be equal efforts and contribution from all sectors for the preservation and promotion of this ethnic and cultural diversity. Nepal is as diverse in her inhabitants as her geography and climate. Religious Tolerance is a MUST! What should be done for the protection of a diversity of Nepalese societies and promotion of National unity? According to which constitution, 'the Nepalese people with multiethnic, multilingual, multi religious, multicultural characteristics and having common aspirations'? Which one of the following is the birth place of Buddha? There has been an effirt made to bring unity in diversity in our national anthem,how? justify. Any Questions on 'Social Harmony '?